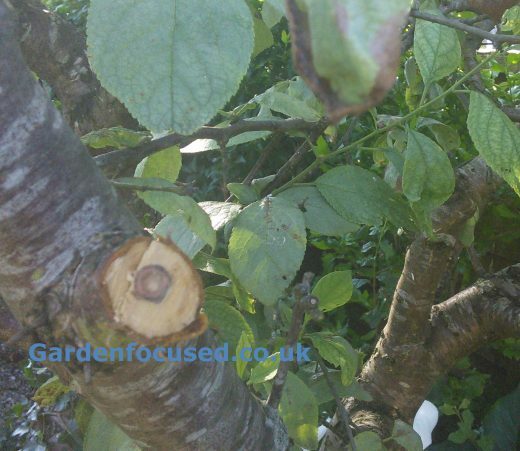 Cherry trees are well known for suffering from a range of pests and diseases in the UK. Treatment has been made much easier in recent years with the introduction of dwarfing and semi-dwarfing rootstocks. Bird damage can now be much more easily controlled because the trees can be kept to a manageable size. The same applies to diseases such as canker - affected branches are within reach and can be quickly treated. A silver sheen to the leaves. This typically does not affect the whole tree, it affects only branches which are suffering from the disease. 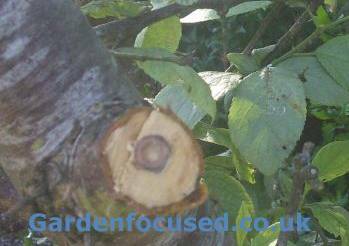 Cut through a suspect branch which is 3cm or more wide and you will see a brown stain in the centre. wet the cut if this is not immediately visible. This is the defining symptom of Silver Leaf in cherry trees. Affected branches will die back. 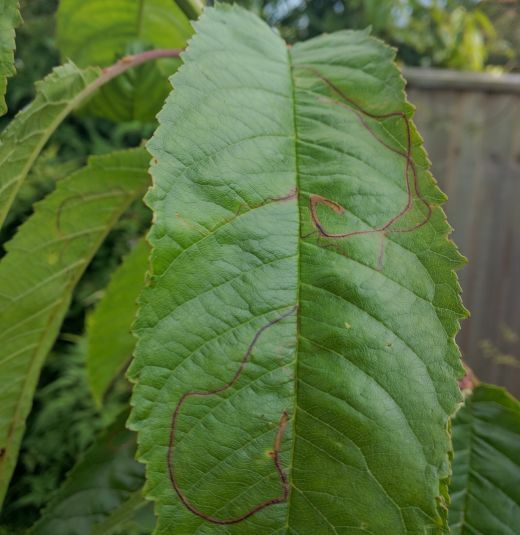 For more identifying features of Silver Leaf and how best to treat it, visit our page dedicated to this disease of cherry trees. Birds can be a real problem with cherry trees and pigeons are the main culprit. There are many suggestions on the internet and in gardening books for deterring them but, take our word for it, only one works. You need to net the fruit tree, or at least individual branches, if birds are a problem in your area. In extreme cases you may not even notice the birds, the only sign of a problem being no fruit. The birds eat the under-ripe so quickly that some gardeners don't realise that birds are doing the damage. 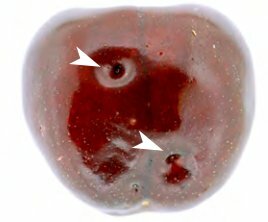 Look for signs of cherry stones in the surrounding area. Birds drop the stones after they have eaten the cherry flesh. 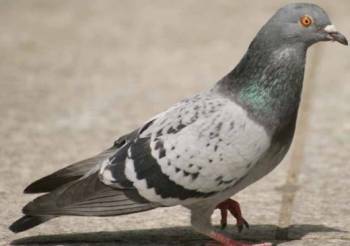 Pigeons have an annoying habit of pecking at the fruit just before it's ripe and it's no use trying to beat them to it. Under-ripe cherries will not ripen when picked from the tree. If your tree is on a dwarfing or semi-dwarfing rootstock such as Gisela 5 or Colt then this will not be too much of a problem. However, if you have a full sized cherry tree (which can easily be higher than a two-storey house) then you have a different problem altogether. Our advice, in that case, would be to buy a new cherry tree on an appropriate rootstock. Not only do we recommend netting as the only solution, but so do all the professional growers. Decoys, hanging CDs, silver foil and other solutions just don't frighten pigeons for long enough. A cherry tree can be productive for many decades so it makes economical sense to buy netting which can reliably prevent birds and which will last for many years. Your own personal experience will dictate when the best time is to cover with netting. We would suggest that initially you try early June. If you find that the birds attack the developing fruit before that then note the time that the damage first starts for a guide the next year. The visible symptoms are squiggly lines which appear on the upper side of the leaves. The lines can be a variety of colours, white or deep brown being the most common (see the picture below). 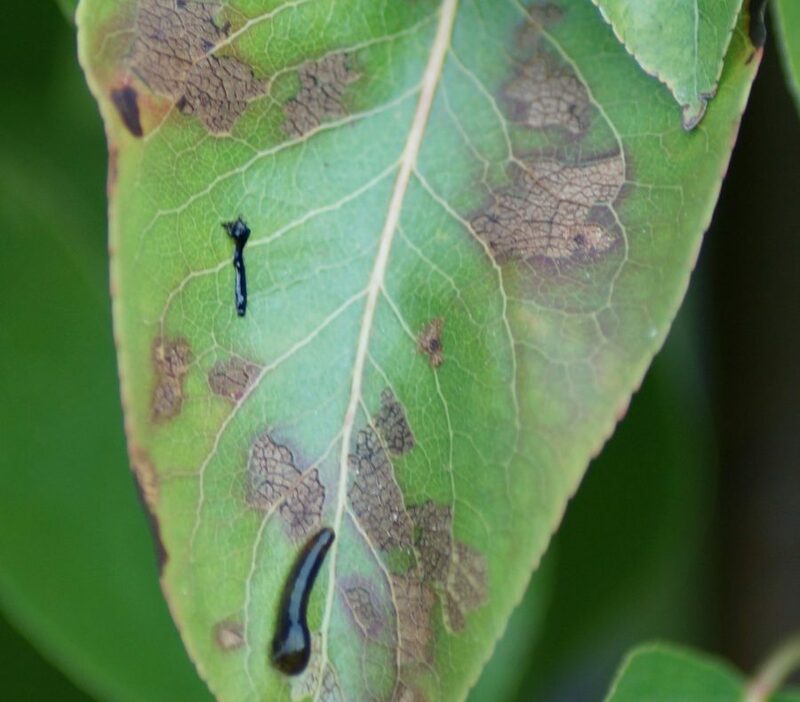 The pest which is causing the damage on cherry trees is Lyonetia clerkella often called the Apple Leaf Mining Moth. They normally have three generations per year. 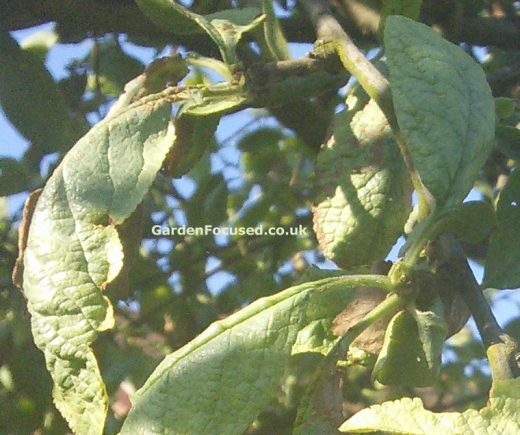 There are no pesticides available to UK gardeners for the Apple Leaf Mining moth. However, although unsightly, they will not affect the health of an established cherry tree. There are two steps you can take to reduce the damage. The first is to pick off and burn badly affected leaves. The second is to pick up all fallen leaves and burn them as well. The pupae overwinter in the bark of the tree or on the ground. Clearing the surrounding soil (and gently hoeing it) of any debris will also help. Branches and stems have sunken and malformed areas on them. The size of the affected area can be as small as a two penny coin but can also spread over very large areas of the branches. Damaged areas will often have a dark gum oozing from them which may harden to become almost solid after time. Leaves turn prematurely yellow but do not shrivel. They drop off sooner than normal. There may be small brown marks on the leaves which fall out leaving the leaves with small holes in them, this often referred to as shot hole. Young cherry trees are more likely to be affected compared to established trees. There are no chemicals or treatments available to the amateur gardener (Bordeaux mixture and similar copper based treatments are no longer sold in the UK) for Bacterial Canker. Your only option is early detection and removal of infected wood. Click here for our page dedicated to the identification and treatment of Bacterial Canker. 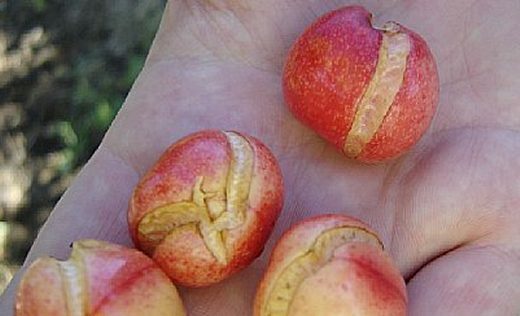 One of the commonest problems with cherry trees is the fruit splitting. 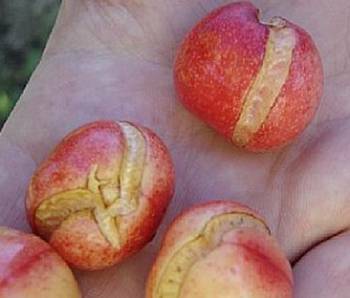 This is not a pest or disease, it is a condition that some cherry trees suffer from. Variable weather can affect the likelihood of this happening. Different varieties of cherries are more or less likely to fruit splitting. For instance, Sweetheart, Sunburst, Summer Sun, Penny and Morello are relatively resistant to fruit splitting and cracking whereas Skeena and Napoleon are likely to have a good proportion of the fruit split. Aside from choosing a resistant variety there is very little that you can do to prevent fruit splitting. Excessive nitrogen contributes to thin cherry skins so avoid this type of fertiliser. Some gardeners believe that overwatering causes splitting but in fact the evidence does not support this. Cherry fruits absorb the majority of their liquid from the fruits surface so it is humid conditions and water on the skin surface which can contribute to skin splitting rather than excessive water at the roots (see this article here). If you can protect your cherries from the worst of the rain then that will help greatly but it's very difficult to do. This is the Cherry Slug Sawfly (Caliroa cerasi) sometimes also called the Pear Slug Sawfly. It affects pear, cherry and apple trees as well as some ornamental shrubs, hawthorns in particular. On fruit trees, the black leech like creatures are in fact green but covered with black slime. The slime is a protection mechanism to avoid being eaten by birds. The lifecycle of the Cherry Slug Sawfly starts with the pupae overwintering in the soil beneath the tree. In spring the actual sawflies emerge and lay eggs on the leaves. The eggs then hatch into the leech like creatures. It is this slug / leech like stage which does the damage. They feed on the upper surfaces of the leaves with their black slime making them very unattractive to birds. The picture above shows the leaf damage very clearly, it is almost always restricted to the top surface of the leaf. The larvae feed for three to four weeks and then fall off onto the ground. They will then hatch into a second generation within the same year and it is this second generation which does the significant damage. This normally occurs in late August to mid September. In severe cases they can damage a huge amount of leaves. They are rarely fatal to the tree and fruit production is normally unaffected because the damage occurs so late in the year. They do make the leaves very unsightly however and can cause problems for already weak trees. Removing them by hand and disposing of them is one solution but the size of many fruit trees makes this a difficult task. They can be knocked off with a strong jet of water. Spraying with a contact insecticide such as Bifenthrin was the most common treatment but in the UK this insecticide is no longer permitted for amateur gardeners. Scotts Bug Clear is the recommended alternative but there is little hard evidence for how effective it is with the Cherry Slug Sawfly. This normally a sign of aphids such as blackfly and greenfly. The most common is the Cherry Blackfly. They attack the leaves causing them to curl upwards and inwards which protects the aphids from predators such as birds. They are attracted to young shoots in particular which may end up as a distorted mass. 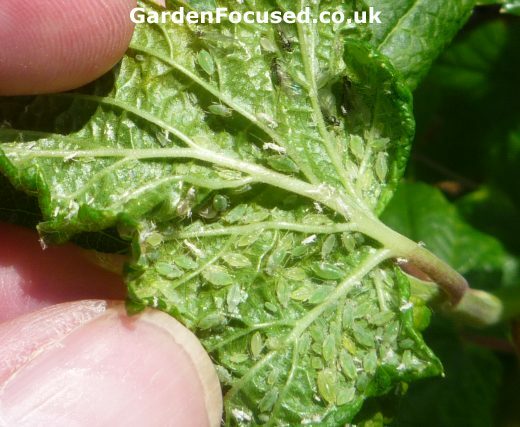 Often gardeners cannot see the aphids with the naked eye and it is necessary to use a magnifying glass. Another sign of aphids is the presence of ants on the leaves or stems of the tree. They farm the aphids and only make matters worse. The earlier you treat aphids the better your chances are of a good crop of cherries. 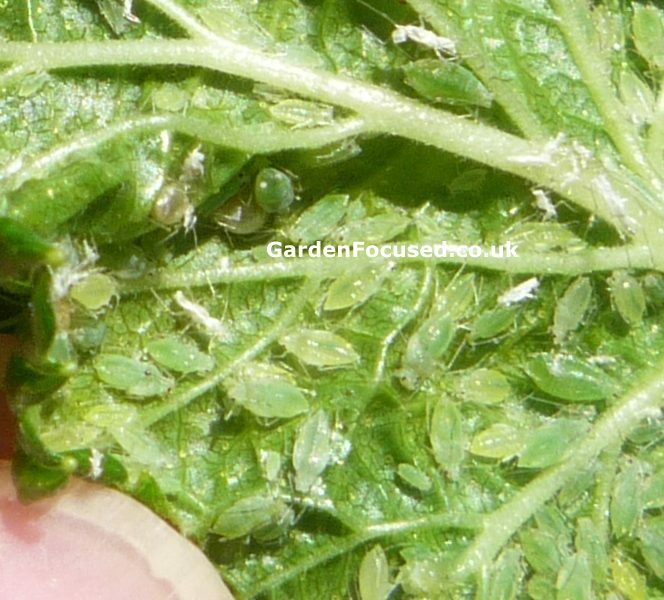 We have a page dedicated to identifying and treating (organic and chemical methods) aphids which can be found here. If the tree is otherwise healthy, fruits dropping off has two main causes. Where 30% or less fruit drop this is quite natural. Cherry trees often over-produce fruit and they have a natural mechanism which causes some of the fruit to fall off before ripening. This allows the tree to concentrate its energies into producing a slightly smaller amount of healthy fruit. Where more than 30% of the fruits fall off before ripening this is sometimes called "cherry tree run off". The exact causes are not known but it is believed to be adverse weather conditions earlier in the season, frequently at blossom time. Currently there is no cure for this. The overall health of the tree is not affected and it should resume normal fruit production in later years. Research is ongoing to find out more about Cherry Fruit Drop an the article found here may be of use. It would suggest that where the problem occurs over several years a solution might be to reduce the number of fruits (as early as possible) to about 2 per fruiting spur. Normally there are six to eight fruits per spur. The first signs of Black Cherry Aphids will be in spring when leaf buds begin to open. 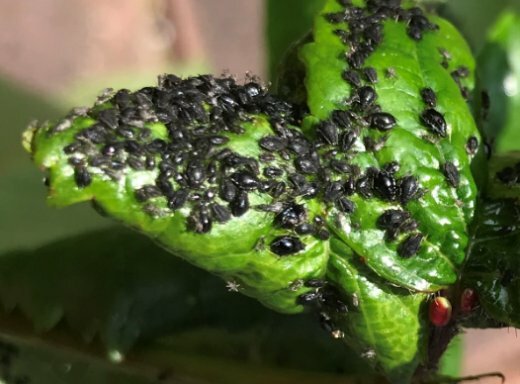 The aphids have a black, shiny surface to them and are about a quarter of a centimetre long. They are clearly visible to the naked eye and will multiply rapidly. They cause the leaves to curl in on themselves making treatment very difficult. In many cases a cherry tree will not be badly affected as far as cropping is concerned although younger trees may be damaged. The aphids will suddenly disappear in July, looking for more suitable food, however the distorted leaves will remain. They should be treated exactly as described for aphids here. The key identifier for Spotted Wing Drosophila is one or more pin prick sized holes in the skin. Later on the fruit will collapse in on itself. This is a difficult pest to control so we have written a page specifically about how to identify it and treatments. Click here for that page. We have moved the Cherry Tree pests and diseases comments and questions section to its own page which can be visited by clicking here. On that page you can view all the previously asked questions / answers / comments and also ask any new questions of your own. The questions and answers page contains a large amount of information about cherry tree problems.